Peek 360 is the fastest, easiest way to record screencasts on a Windows PC. Simply record your screen and narration. Your screencast will automatically upload to Articulate 360 when you're done recording. Then you can collect feedback with Review 360 or download your video as an MP4 file or LMS package. If you haven’t already done so, install the Articulate 360 desktop app on your Windows PC. Open the Articulate 360 desktop app and click the Install button next to Peek 360. Peek 360 will automatically install without any additional prompts. Peek 360 always runs quietly in your computer’s system tray (beside the clock). To record a new screencast, just click the Peek 360 icon in the system tray and choose New Recording. If Peek 360 isn’t already running, you can launch it by going opening the Articulate 360 desktop app and clicking the Open button next to Peek 360. 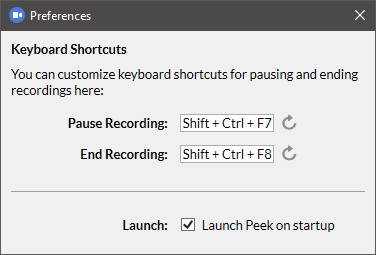 Tip: You can also right-click the Peek 360 icon in the system tray and choose Preferences to customize your keyboard shortcuts for pausing and ending recordings. First, Peek 360 will ask what you want to record. Choose one of your open programs or your entire screen, then click Select to launch the recorder. Want to track learners progress as they view your screencast? Articulate 360 can help with that. Just export your screencast to an LMS package, then upload it to your LMS. Go to your Rise 360 home page and open an existing course or start a new one. Add a video lesson to your course. Thumbnail images for your Review 360 videos should appear. Simply click the one you want to add. Since Peek 360 generates an MP4 file, you can upload your screencast to video-hosting sites, such as YouTube and Vimeo. Peek 360 screencasts are easy to share via social media sites, such as Facebook and Twitter.